THIS BOOK’S PRIMARY aim is to capture, in broad and impressionistic strokes, the experience of the European intellectual community in the period before, during, and immediately after World War II. 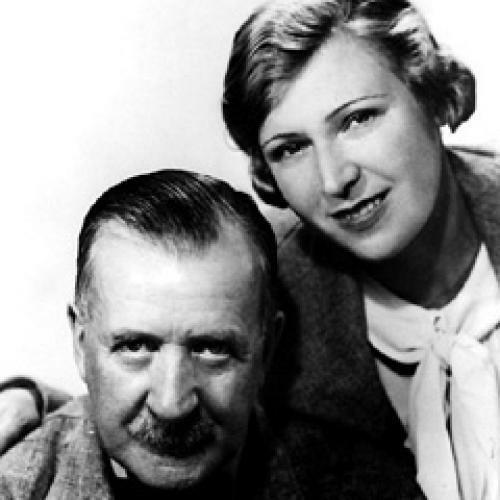 Heinrich Mann and his second wife, Nelly Kroeger-Mann, are nominally the story’s central figures, but Thomas Mann plays at least as big a part, as do Virginia Woolf and others. Often these people are related to one another by nothing more than the shared calamity of the war, and although Evelyn Juers is primarily concerned with the trials of emigration—Heinrich and Nelly follow Thomas to California, as does Bertolt Brecht—the war is the basic organizing principle of her narrative, and her title may refer more to spiritual or metaphysical dispossession than to the reality of everyday life in another country. The Woolfs do not emigrate, but they are set adrift nonetheless. From this perspective, the section devoted to Nelly’s early life is the most problematic. After an introductory passage that reads more like free-association than anything else, Juers attempts to explain herself: “The piecing together of Emmy Kröger’s biography [Emmy took the name “Nelly Kroeger” later] now depends largely on Heinrich Mann’s and Joachim Seyppel’s books and their mix of truth and factual misalignments, some anecdotes, and a small amount of archival material such as letters, bills, and photos.” But the Heinrich Mann book to which she refers is a novel. By extrapolating biographical information from a work of fiction, Juers is muddying already murky waters. What she does not say, in addition, is that now and then she invents details of her own. How Juers can fault another writer for the kind of embellishments that she herself practices is a mystery to me, and it is astonishing that she expects readers to swallow the first chapters of House of Exile. But perhaps the greater mystery is how she is able to salvage the book, because that is what she manages to do. And even more mysterious is that she does so without abandoning her original method. She continues to make wild conjectures, to invent details, and to hunt for biography in fiction, but at the same time everything seems to tighten up. Moony impressionism begins to ring with horror, and the book becomes fascinating and compelling and hard to put down. The only requirement is that we set aside the idea that we are reading a work of scholarship. This is history as vision or nightmare, a history of subjective experience. Compare the passages above with one drawn more or less arbitrarily from the end of the book. Here we follow Thomas through America in 1939: “In St. Louis he had lunch with a bishop and a rabbi; drank Coca-Cola with ice. Throughout the trip he took a variety of pills, to liven him up or calm him down. Hitler’s triumphal procession through Berlin. St. Louis zoo; attractive young men working as porters at the Fort Worth Country Club in Texas … In Seattle, where 3,000 people attended his lecture, he wrote in his diary on Wednesday 29 March that the capitalist world was being forced into war by Fascism, its pampered offspring.” The mode is the same—we do not know where these details come from, the sentence structure is varied and erratic, and the juxtaposition of detail is jumbled and excessive—but weirdly it works. This is a vivid representation of chaos. As scattered and diffuse as House of Exile remains, a larger philosophical purpose eventually begins to emerge. We see it clearly in Juers’s fascination with Nelly, whose story is impoverished for exactly the reason that makes it critical to an understanding of the book: Nelly is not an important figure, and there is not much information about her. She gets lost, like millions of others, in the huge shuffle of history. To Thomas Mann, she is crude and boorish, a throwaway figure, “an awful trollop.” Thomas’s son Klaus, who would eventually take his own life, reacted to the news of Nelly’s suicide by writing, “What deplorable, objectionable lack of consideration and self-control!” And although her suicide is very sad, there is an element of indulgence and banality even in Juers’s sympathetic account. House of Exile is about how individual people, only some of whom happen to be famous writers, react to a common set of pressures. Given this approach to history, Nelly is no less important than Thomas Mann, and that is how she is portrayed here. Indeed, we get to know Thomas in much the same way we get to know Nelly. We hear very little about the books and the prizes, and instead we read about the small miseries of daily life: his repeated lamentation that sea air functions as an aphrodisiac; the cocktail of pills he has taken on an unremarkable Wednesday; his concerns about digestion. Brecht gets the same treatment: we learn about the movies he goes to see. We learn that Virginia Woolf got very angry when she lost to Leonard in their evening game of bowls, and that she took a break from writing one day in order to sew blackout curtains. The FBI placed most of the German émigré writers under surveillance, and from those reports we learn about the drudgery of forgotten dinner parties. We see Lion and Marta Feuchtwanger reading cookbooks to each other in order to frustrate the FBI listeners. This way of looking at the history of private life would not be so effective if Juers were not willing to adopt the freewheeling style that makes House of Exile so challenging in the early going, and for that we must give her credit, because the product is wonderful and it has a great deal to teach. The pain of dispossession and war is personal, after all, articulated in just the sort of details that seem most irrelevant. Why should we care about the difficulty of getting gooseberries in Los Angeles? Because on any given morning, it is the difficulty that matters. This is the way individuals experience the abstractions of politics and history.